Another little “European” charm place (see also Mateo, Toro, …) for Durham. Irresistibly cute shop with fantastic ice creams. The also offer indulgent sundae combinations. I got the malted milk chocolate and it was smooth, rich, creamy – superb! Intial impressions of greatness confirmed! Mateo has got to be one of the top restaurants in the Triangle. And, after visiting Curate in Asheville, I’d say this place is just as good, or even better. We tried a whole host of different things. Standouts were the tortilla espanola, a think quiche-like concoction with tender thick-cut potato slices, some very nice meatballs in a tomato sauce, and a chicken/sherry/shallots/lemon/thyme/grits affair that I will be trying in vain to re-create at home. As for Toro, the mushroom pizza is another winner. Just the right amount of oil and coarse sea salt on a blistery crust, some fine cheese, flavorful local shrooms, and herbs. Perfecto! Well they can’t all be winners. I had been excited to try this place, which cooks over wood. But the BBQ was pretty lifeless and kind of dry. The corn pudding on the side was undersalted. It’s nice that they have three kinds of coleslaw (regular, western, and mustard), but the “regular” was nothing to write home about. The ribs were better, although I didn’t love the ketchupy sauce. The best thing was the hushpuppies, little balls of fried goodness. Backyard Bistro is the closest restaurant to the PNC center in Raleigh, and it’s adjacent to a large hotel. From these facts alone you might surmise that the menu features burgers, wings, and beer, and that the ambiance caters to those who desire the the closest approximation to being in the stadium for a sporting event, without having to actually purchase tickets. You’d be correct. For some, tailgating is the event. The restaurant was sparsely populated on a recent event-free night at the stadium. We were seated at a huge booth that was angled for better viewing of an enormous wall of TVs, each tuned to a variety of – you guessed it – sports programming. In fact, scarcely a free surface in the place remains untouched by sports theming or memorabilia. With the lights dimmed, the experience felt more like being in a theater than in a restaurant. Backyard Bistro does have an appealing, and big, outdoor tented area, a large bar, and a section of tables a little farther removed from the wall of sports TVs. But they clearly know their audience: the game comes first; food is more of an afterthought. The menu is expansive and includes pretty much all of what you’d usually find at a large suburban American restaurant. I ordered a bbq sandwich with regular fries. My wife ordered a taco salad ($9). In keeping with the nature of the restaurant, and the general status quo of such establishments, the portions were enormous. My dinner in particular was a great value at only $7. Sandwiches are served on light, airy La Farm brioche buns, which is a nice touch. The meat part of my dish was fine, tender and moist, but the vinegary slaw and odd sauce (served in a little plastic cup on the side) were really underwhelming. That said, the worst part of my meal were the fries, which were soggy and seemed almost uncooked. I couldn’t eat them. My wife reported her entree to be pretty run-of-the mill. It’s just one visit, to be sure. The fries might have been an aberration, and the guys over at The Straight Beef liked their burgers just fine. Still, I doubt that I’d return, even if I had a nearby event to attend. Raleigh’s The Pit has received so much attention over the years that you’d think it was some kind of legendary establishment – the kind of place that makes Raleigh. In fact, the place is more of a curiosity, in terms of ambiance and popularity, and, unfortunately, not terribly exciting in terms of food. It’s about as far as you can get from Allen & Son’s – a little shack lost between Chapel Hill and Hillsborough, where the meat cooks over wood for most of the night – and still be called a North Carolina barbecue restaurant. The interior of The Pit is moderately swanky, mostly as a result of the building’s previous incarnation as an upscale steakhouse, but partly, one suspects, as a deliberate branding angle. It’s not a white tablecloth affair, but the wait staff does wear all black and shuffles to and fro discreetly. It’s certainly a far cry from your average no-frills bbq joint. There’s a large bar area with plenty of high tables near the front door, and a couple of more stately dining areas. The place is huge, but it gets packed, always. You can take a date here, or your family, but it seems best suited to a business meal. On a recent lunch visit, I ordered the chopped bbq plate ($7.99), which comes with two sides, a biscuit, and a couple of hushpuppies. The plate is a much better value than the bbq sandwich, which comes with only one side (and no biscuits or hushpuppies), but costs only $0.40 less. At dinnertime, the cost of the plate entrée jumps up 50% to $11.99, so beware. The barbecue itself was rather flavorless, even with a liberal application of sauce at the table. It lacked smokiness but at least it wasn’t mushy. I chose collards and cole slaw as my side items. The collards were pretty bad – too vinegary and not tender enough; the cole slaw was average. My biscuit was also lackluster. It was soft and buttery, but it seemed like a frozen biscuit rather than a scratch-made creation. The Pit does have good sweet potato fries, and some regular fries I tried were also pretty tasty. But the best part of my meal was the excellent hushpuppies. I would have traded all of my side items for a basket full of those. In the end, it was an uninspiring and forgettable meal. While the value at lunchtime is good – you get a lot of food – I’m not really eager to return. I have heard that the ribs are very good, but I’ve yet to try them in several visits. [Although former head chef and NC bbq icon Ed Mitchell defeated Bobby Flay in a rib “throwdown” a couple years ago, he is no longer associated with the restaurant]. So, even with a general lack of good bbq restaurants in Raleigh, The Pit doesn’t really stand out. I’d rather drive a little ways out to the aforementioned Allen & Son’s, or perhaps to Stephenson’s (near Benson), or The Pig (Chapel Hill) for a more rewarding bbq experience. If you love food and live in Raleigh, or indeed anywhere in the Triangle, the following are some exciting developments that will make the city an even more alluring dining destination. The imminent openings of Ashley Christensen’s new ventures: Beasley’s Chicken & Honey (featuring fried chicken, set to open as early as this week), and Chuck’s (featuring burgers). There’s also the Fox Liquor Bar, which will share a kitchen and taps with the other two joints. Beasley’s promises to be awesome because, well, it’s fried chicken, and because the former pastry chef from Chapel Hill’s now-defunct Cypress on the Hill will surely craft some great desserts there. And you can bet that Chuck’s will be great if you’ve ever had the Royale with cheese at Christensen’s flagship establishment, Poole’s Diner. Check out the recent feature in the Independent weekly for more information (and some pictures of the restaurants’ interiors) or head over to ac-restaurants.com. 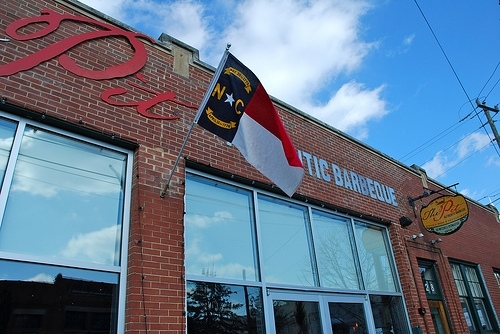 Word today that Allen & Son’s, the region’s marquee bbq joint, is planning an expansion to Raleigh’s Five Points area. Not many details yet, but this is definitely an exciting development for bbq lovers who don’t get out to Hillsborough or Pittsboro that often. Thanks to GoGoRaleigh for this tidbit. In the world of barbecue, much is made of tradition – doing things the way they’ve always been done. There’s something to be said for this: some of the best cue you’ll find in the Triangle comes from Allen & Sons, where Mr. Allen still gets up in the middle of the night to chop hickory wood and start the meat cooking for hours and hours. This traditional formula has been tweaked over the years to the point that nowadays most barbecue is cooked over gas. More recently, the cuisine has been updated by places like The Pit in Raleigh through the use of local, pasture-raised, hormone-free meat sources. The Pig in Chapel Hill builds on this progression but takes it all even further, with an ambitious menu that aims to please the meat lover and vegetarian alike. The building is located in a small shopping center off of Weaver Dairy Road. Despite a large façade, the restaurant feels tucked away (it’s easy to pass right by). The inside is quite modest and small, and, like a prototypical bbq joint, lacks much of any adornment. The menu is scrawled on a large chalkboard above the tiny kitchen, and is impressive in its scope. Items include not just bbq, but also pork belly sandwiches, catfish po-boys, homemade pastrami and bologna, and, for the vegetarians, country-fried tofu, shitake po-boys, or a sweet PLT sandwich (sweet potato, lettuce, tomato). There are usually some additional specials as well. The list of side items is equally tempting, if a bit more traditional: hushpuppies, mac & cheese, collards, baked beans, fried okra, mashed potatoes, and so on. I ordered the pork belly sandwich ($6.50, with pickles on the side) and a side of sprouts n’ shrooms ($3.25). Having the sides priced a la carte like this can lead to a pricey meal, particularly if you opt for a sandwich as your main item. My wife ordered the small bbq tray ($7.50), which came with slaw, hushpuppies, and pickles. I’ll summarize right here by stating that, with the exception of the hushpuppies, everything was incredibly delicious. The pork belly was meltingly tender and had a nice sweet glaze on it. The slaw on the sandwich included plenty of carrots, and made the end result even better, though the whole thing was served on a cheapy throwaway bun. The pickles were fantastic; they were crisp and sweet and tasted as though they’d only been marinated for a day or less. Not being a huge fan of pickles in general, these were just right. The sprouts n’ shrooms was a small bowl of charred brussels sprouts and button mushrooms. It was good too, but I’d probably try a different side item next time. Perhaps I’d choose the fried summer squash or okra, both of which I also had the chance to sample. The squash was served as thin golden planks of crispiness, seasoned with coarse salt and oregano. The okra was also crusty and delicious, and heavy on the chili powder. The hushpuppies, being more of an underseasoned cornbread fritter, were a departure from the norm, and weren’t a big hit with me or the rest of our party. It’s normally very hard for me to lay off the hushpuppies at a bbq restaurant, but these didn’t keep me coming back for more. As for the bbq itself, I thought it too was great. It lacked smokiness but was very flavorful, having arrived well sauced from the kitchen. Having tried many bbq restaurants over the years (and enjoyed most all of them), I love the approach that the Pig is taking. I’m excited to go back and try more of their menu. Here in North Carolina, people argue passionately about barbecue. Is it cooked over wood or gas, is whole hog or just the shoulder, is it sauced with a tomato or vinegar-based concoction? I appreciate the attention to detail, but in the end, for me, it doesn’t much matter. I like it all. While Eastern-NC style is what I’m most familiar with, I’ll happily consume just about any variety of tender meat and flavorful sauce. Which brings me to Danny’s bbq. Located in a nondescript strip mall off of Tryon Rd, it’s not your typical southern bbq joint, and it doesn’t serve your typical Carolina style bbq either. I read somewhere that Danny’s was something closer to Florida style, but I couldn’t tell you the first thing about what that might signify, or whether it’s even remotely true. I can tell you that I’ve had something similar to Danny’s in Buffalo, NY (at a place called Kentucky Greg’s, of all things). So, if you can figure out where Danny’s falls on the bbq map, let me know. Danny’s serves its meat relatively unadorned. This is good and bad. The good is that you can choose from the four sauces that adorn your table, including a sweet dark red sauce, a spicier version of that (though not too hot), a mustard-based concoction, and a simple vinegar-based one. The bad is that the meat itself, while smoky, can be a little bland and dry, and requires a good bit of sauce. But add a bunch of that sweet dark sauce and it can be mighty tasty. 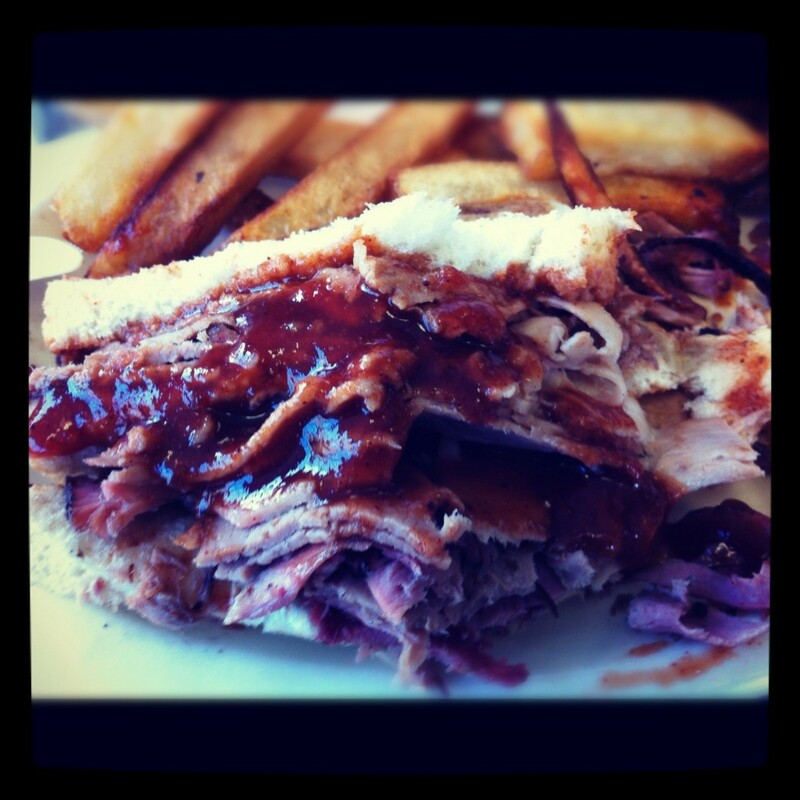 Thankfully, prices are in line with classic down-home bbq joints – a bbq sandwich and side is only $5.50. Danny’s also does ribs and smoked turkey, and they’ll cater events. So while it’s definitely not close to being my favorite area bbq, and the NC bbq purist might cringe, for the less discriminating bbq eater like me, Danny’s is worth a try. This past weekend involved a quick trip up to our nation’s capital. While we didn’t have much time for exploring the food scene up there, we did have a couple of noteworthy culinary experiences. For the ride up, seeking to avoid a boring fast food meal, I had conducted extensive research into alternative places to eat along the way. I confined my search to places not far off the interstates (I-85 and I-95) that were also cheap and quick. Luckily, we were approaching Richmond around dinner time, so we decided to head downtown the place of the top of my list, Buz & Ned’s BBQ. Getting there in rush hour turned out to be a slow haul, but it was worth the detour. It’s a small space but service is quick: just place your order at the counter and they’ll call your name within a few minutes. I got a pork bbq sandwich that was oh so good. The meat was magnificently tender and smoky, doused in a tangy sauce, and served on soft bun. Unfortunately the side items, including hush puppies and some cinnamon bourbon apples, were just average at best. But I would definitely go back for the bbq – it was fabulous. 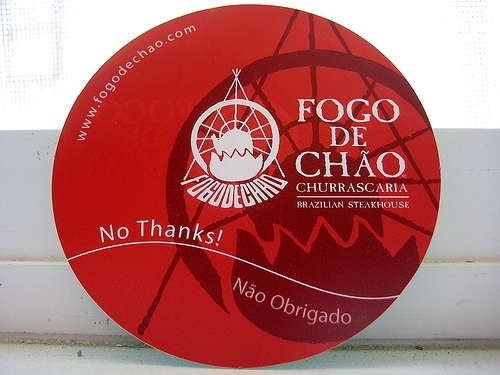 The next day, for my friend’s bachelor party dinner, we headed to downtown DC for an all out meat-fest at Fogo de Chao, the upscale Brazilian steakhouse located just blocks from the White House on Pennsylvania Ave. The place is huge but it was packed with everybody from families to dressed-up couples. Fogo de Chao features scores of different meats, of course, sliced for you tableside, but they also have a tremendous “salad” bar. The latter contains many tempting items such as prosciutto, good salami, a giant wheel of parmiggiano-reggiano, other fine cheeses, and side items from roasted potatoes to an assortment of green vegetables. There are also huge slices of crusty bread, but you’re better off going with the small cheesy-poofy rolls that come straight to the table. These are quickly followed by the meats – ribeye, bottom round, filet mignon, bacon-wrapped chicken, pork tenderloin, lamb chops, sausages, and on and on. As if that weren’t enough, they also bring out mashed potatoes, rice & beans, fried bananas, and crispy polenta. It just keeps on coming until you flip your card (pictured above) from green to red: STOP! My favorites were the tender filet mignon, the succulent chicken, and the delectable lamb chops. Everyone else loved the rib eye steak. I found the cuts of meat, with the exception of the filet mignon, to be inconsistently cooked. I got some really overcooked pork loin and steak pieces. The little sausages were quite average as well. And all of the side items, save perhaps the crispy polenta, were lackluster. But, we certainly got our fill. At $50 a head (not including drinks), I doubt I’d ever go back, but it was a neat experience with a group of great friends. I finally made it to Lexington BBQ #1, or HoneyMonks, or whatever it’s called. I had always wanted to go there as they are renowned for their pork. Save perhaps for their giant billboard-like sign (you can’t miss the place), this is your typical southern barbecue joint – the take-out side with folks waiting in their cars, the old formica counters, the legions of loyal patrons, the self-seating, the ultra-quick service. It was definitely one of the top five NC barbecues I’ve had, but I was not blown away. The meat was chopped to bits but not mushy, and was less saucy than I thought it would be, but in a good way. The sauce was nicely subtle, delicate even. I was not a big fan of the “western-NC style” coleslaw, which incorporates the same (or similar) sauce. The flavors of the slaw were a bit muddy to me. The hushpuppies, on the other hand, were fantastic. Nicely cooked, with a creamy, fluffy interior – they were irresistible. I’m glad I tried it, but I’m not sure I’d drive two hours just to eat there. In the world of NC barbecue, Allen & Sons still reigns supreme for me.